Shell’s Trader Development Programme (TDP) could be your passport to a successful career with the world’s largest energy trading business. Join us and work though a structured 2-3 year programme to learn everything you need to know to become a trader. Shell has hubs across the world and trades in crude oil, natural gas, LNG, electrical power, refined products, chemical feedstocks and environmental products. For us, finding the right future traders is vital – they have the power to make a massive impact on our profitability and market position. That’s why we look for women and men who bring us diverse professional perspectives, life experiences and educational backgrounds. If you’re a graduate who’s already proven your commercial acumen and enterprising flair in the workplace, you could join us for the next 2-3 years in London. You don’t need trading experience – we’ll help you cultivate the skills you need to flourish in one of the world’s most entrepreneurial and exhilarating working environments. Our shared values of honesty, integrity, and respect aren't simply a strapline. They're part of everything we do. An equal opportunities employer, we place the highest value on our inclusive approach and do all we can to make this a flexible and supportive place to work, backed by a leadership team that's fully supportive of our diversity ambitions. And it’s important to us that we the way we trade is ethical and compliant. Although trading demands individual decision-making and independent thinking, it’s good to know you have the full backing of a business with a strong history, a powerful brand and a huge product range. When you join Shell, you’re part of a diverse team of c.85,000 people, working across 70 countries. We’re an end-to-end, fully integrated business. So, unlike some of our competitors we don’t just trade commodities; we extract them, refine them and ship them all over the world. Ask any of our trainee traders and they’ll tell you that there’s a wealth of experience to tap into here. You’ll share the trading floor with some of the sharpest people in their field – learning how to outmanoeuvre the market and outpace the competition from some of the best in the business. From day one, you’ll feel very highly valued. Our teams trade the equivalent of 13 million barrels of oil every single day. They occupy an influential position in the business; we trust them to shape our prosperity and generate commercial value. Naturally, we invest heavily in nurturing the next crop, both financially and in terms of the time and attention we devote to our trainees. Life never stands still in trading. It’s a hugely fulfilling career for people who want to take responsibility and add value to the bottom line. You’ll learn how to see the bigger picture and the finer details; how to keep pace with macroeconomics and stay one step ahead of the market. As a trader, the stronger the relationships you build, the better the deals you can strike. If you pride yourself on being a versatile communicator, you’ll be in your element here. You’ll work in an open, collaborative culture and make connections with people in different parts of our business, all over the world. There’s a world of opportunity here. Our Trading & Supply business is one of the world’s largest energy trading operations. We have hubs in Dubai, Houston, London, Rotterdam and Singapore, trading in crude oil, natural gas, LNG, electrical power, refined products, chemical feedstocks and environmental products. Joining Shell’s Trading division will position you at the forefront of one of the largest energy trading operations in the world, with a global trading network that comprises of Crude Oil, Chemical Products, Natural Gas, Power and Environmental Products. In a fast-paced environment that oversees trading volumes of around 13 million barrels of oil equivalent per day, quick thinking, problem solving and innovation are key attributes you will need in order to develop a fulfilling career at Shell. You’ll have the opportunity to make an impact on how the Shell team works together towards a socially conscious and cleaner energy future. From our main Trading hubs in London, Houston, Rotterdam and Singapore, you’ll have the chance to make a significant impact on our organization’s bottom line through the trading of natural gas, crude oil, oil products, chemical feedstock, biofuels, energy and freight. ROLES AND RESPONSIBILITIES Over the course of the Programme you’ll sample the diverse range of challenges integral to becoming a successful trader in Shell. The TDP is designed to turn today’s talent into tomorrow’s traders. It will help you develop the skills and gain the experience required to build a successful trading career with us. Typically, the TDP takes 2-3 years to complete but no two trainees follow the same route. You’ll find that the TDP is highly individualised and dynamic, tailored to your aptitude and experience, as well as the requirements of the trading desk you’re working on. With the ongoing support of an experienced, dedicated mentor, you’ll be learning on the job alongside some of our very best traders. Depending on your skills and the demands of the business, you can expect to be exposed to one of the following: businesses: crude oil; oil products; LNG; carbon; gas and power trading. Shell’s culture of continuous learning develops the skills essential to a range of business tasks, focusing on training areas such as market analysis, trading and pricing strategy, nurturing business partnerships, trading operations and leadership development. Along the way, you’ll sharpen your ability to analyse markets and develop trading strategies, unearth opportunities to generate profit and manage risk, and learn how to successfully negotiate and structure deals. We’ll give you plenty of feedback and assess you regularly– there are several ‘stage gates’ that you need to pass through – so you’ll always know how you’re progressing. At the end of the TDP, there’s a final assessment to validate your readiness to trade. Pass this and you’ll be officially Trader Ready and fully equipped to apply for a permanent Trader role with us. You’re numerate and highly analytical. You’ve shown you can digest wide amounts of information from different sources, pinpoint the relevant details from a huge range of data, and synthesise it to form critical insights. The market changes by the minute so you need to be comfortable thinking on your feet and making quick decisions, even if you don’t have all the facts at your command. Speed of thought is vital you’re someone who can move easily between a micro and macro view. This is a highly open, collaborative environment where we achieve results through teamwork. You’ll be talking to colleagues and contacts all over the world, so you’ll need to be able to change your social style to suit your audience. We value people who’ve proven they can persuade and influence; in English and, ideally, a language native to the market you’re working in. You’ll need to cultivate an incisive understanding of how global energy markets work – that means you should be entrepreneurial, self-motivated and commercially astute with a keen interest in how business works. You’re passionate about working in trading and excited by the prospect of finding opportunities to create monetary value. In trading, the risks you take must be calculated and the decisions you make considered. You’ll be accountable: someone who takes responsibility for their decisions and can adhere to both the letter and the spirit of all relevant legislation and compliance. You’ll always work with Shell’s values of honesty, integrity and respect for others firmly in mind. 1. Trader Capacity: This refers to the ability to analyse and synthesise multiple sources of information, and understand the strategic context and commercial factors in which the Trading organisation operates. It also involves the ability to produces useful, creative, and innovative solutions to problems. 2. Trader Achievement: This refers to the ability to learn quickly and continuously, persevering despite obstacles in a challenging environment. 3. Trader Relationships: This refers to the ability to build effective relationships with a wide range of people, and being a true team-player. The Stage 1: Phone Interview consists of two assessments: A Commercial Case Study, and a Competency Based Interview. Please see below for a brief outline of each assessment. COMMERCIAL CASE STUDY: In the case study you will be presented with a commercial problem and asked a series of questions to assess your capacity for strategic thinking, numerical ability, and ability to propose solutions to problems. COMPETENCY BASED INTERVIEW: In the competency based interview, your interviewer will ask you a series of questions to learn more about some of your relevant past experiences and, in particular, how you dealt with specific situations. It is recommended that you come prepared to discuss specific tasks/projects you have worked on in the past 18 months, or which you worked on in your last role if you have not been working in the last 18 months. At the end of the interview there will be some questions to help us identify why you are interested in the TDP. Make sure you’ve done some research in to the programme and are able to articulate why you are interested in a career in Trading. Finally, you’ll have an opportunity to ask your assessor some questions. This part won’t be assessed, but it’s a valuable opportunity for you to find out a bit more about Shell Trading and your potential career here. I wasn’t successful last time, can I re-apply? The thing people love most about working at Shell, is the people. Explore these ten films featuring colleagues from across Trading and Supply; from Sophie on the TDP and Lifei who completed the programme, right up to Andrew our Executive Vice President. Find out for yourself if this is the team you want to surround yourself with, to set you up for success. Sophie Tao talks about her job on the Trader Development Programme on the crude trading desk, based in London. My name is Sophie. I’m on the Trader Development Programme on the crude trading desk, based in London. So the Trader Development Programme is a structured programme helping to develop the junior traders to get the experience they need to become a trader. The management team in trading, they are very supportive as well, so I normally have a regular catch-up with a mentor or with my line manager. They provide the support and they give me advice where I need to go next in order for me to become a trader in the future. Shot of Sophie walking through busy office with many people working at desks. Close up of Sophie talking to camera. Sophie talking to line manager or mentor in booth. Close up of Sophie taking notes. Man talks to Sophie. Shot of many monitors with changing information onscreen. Man pointing at map. I think the [unclear] main factor is why I want to join trading. First of all I think trading is a very fast paced environment, working in trading can have a direct impact on the bottom line. And secondly, I think Shell trading has an advantage over other financial institutions or the trading house because Shell has such large physical assets across all the regions. So, last year I think crude oil market is a very dynamic market and it’s integrated. Basically for me to look at, for example, the supply and demand of [unclear] and I need to talk to the colleagues in other offices to get an idea of what’s going on in other markets. So, in that sense, Shell is actually a very good place for me to get exposure to different markets, and I think that’s not an experience I probably can get in any other company. Man pointing at map. Close up of people working at desk and man pointing at monitor. Various scenes of people working at desks. Shot of monitor showing different coloured flickering figures changing. Scene from behind of two men in front of a bank of monitors. Close up of Sophie talking to camera. Sophie and other people watching something in front of them [Unseen]. Man pointing to map. A group of people watching something and having conversation. Sophie taking notes. Sophie talking to camera. Most people may have the impression that trading is a place that people sit in front of their computers dealing with the numbers all day – it’s not entirely true because managing the relationship and communication is just as important. Our traders, they normally visit their counterparties or refineries, from junior analyst level we also work closely with colleagues from parts of the organisation just to get the information flow and the information flow in this place is very important. Sophie sitting at desk in front of computer. Close-up of hand on mouse. Monitors showing flickering coloured numbers. Sophie at desk talking to someone at her side. Bank of monitors showing different figures. Sophie walks through office and stops to talk to someone. Sophie talks to camera. Sophie talking to colleague. Sophie and a colleague sit at table in restaurant drinking coffee. Sophie talking to camera. Sophie sitting at desk making notes. I think that there are a few attributes that helped me to get here. First of all I think the strong analytical skills have definitely helped me. On a daily basis we do all the analysis work to help the team to form trading decisions. And lastly, I think people skills, be comfortable working with different stakeholders and getting information from them, I think it’s a key aspect of the job. A bank of monitors each showing different views. Sophie at desk. Sophie moves to another desk to talk to colleague. Sophie walks through office and stops to talk to man on her way. Sophie talks to camera. I think it’s a great place to work because the market is very dynamic and every day the headline news can have a direct impact on P & L and working with probably the best people from the organisation is really a privilege. View from behind of lade looking at monitors which show different numbers, changing quickly. Camera pans over monitors showing graphs and charts. Close-up of man talking to Sophie. Sophie talks to camera. A conversation with Karrie Truath. I joined Shell five years ago as an experienced hire. I worked in the shipbuilding industry for the US navy before joining Shell. So I spent a couple of years in Houston learning about Shell, learning about the oil and gas business, came here to London and now I lead our technology and innovation organisation, creating overall maritime solutions for group business. Reverse-angled view of Karrie Truath sat looking at two computer screens in front of her. The shot slowly goes out of focus. From the same angle, a model ship of the Cardissa [?] comes into focus. Close-up of Karrie Truath speaking to off-screen interviewer set against an out-of-focus background. One of the things Shell’s very good about is identifying development plans, identifying what needs to be learned, creating the space and creating the network to do that. So early on I got a business mentor as well as a technical mentor to help me through that journey, and both my line manager and my colleagues and my HR business partner were fantastic about reducing, as well call it, my time to autonomy. Close-up of Karrie Truath looking down at her keyboard and then looking up at a computer screen, then panning down bringing into focus a close-up of her hands typing on a keyboard. Close-up of Karrie Truath, computer screens all around her. Close-up of her computer screen. Back to close-up of Karrie Truath speaking to off-screen interviewer. We talk about Shell’s leadership attributes of authenticity, collaboration, growth and performance. As you can see right now, I bring myself, my whole self to work every day, so authenticity has served me well throughout my whole career. But collaboration, particularly as an XP hire, as an experienced professional hire has been the most important because I needed to build relationships very quickly in Shell to understand the business, but also to make those key contributions. Close-up of the side of a lady’s face as she looks at several out-of-focus computer screens with post-it notes stuck to them. Close-up of a computer screen. Wide-angled view of two men discussing whilst looking at the computer screens in front of them. Side-angled view of a man standing up, pointing at a very large screen depicting a map of Southeast Asia. Back to close-up of Karrie Truath speaking to off-screen interviewer. While there aren’t so very many women in the organisation, we have an incredibly inclusive culture and I felt welcome from day one. But then on a personal development perspective, the opportunity to grow in Shell, who are such a large company, there are so many different business lines, different areas where you can apply your skills, that to me is a huge selling point for Shell, a big employee value proposition, if you will. Wide-angled view panning right to left of the trade floor, showing people sat at desks with many computer screens in front of them, lots of different small country flags attached to the desktops. Close-up of six computer screens, panning upwards slowly. Wide-angled view of the trade floor, a lady approaching, walking down the aisle. Shot of two female colleagues at a desk. One lady is gesticulating while the other looks down at something on her desk. Close-up of a lady looking at her computer screen. Close-up of a man talking. Pan right to show Karrie Truath listening and then talking to the aforementioned man. Wider angle of the same shot showing Karrie Truath and the man talking. Close-up of Karrie Truath nodding. Back to close-up of Karrie Truath speaking to off-screen interviewer. What I most enjoy about my job, it’s kind of a… it’s a tough one and I’m going to give you two answers to that. The first one is the people. It’s the people I work with, it’s the people who work for me and the people I work for. The energy, the professionalism, the drive, the knowledge, the capabilities we have, really second to none. And the second bit is my ability to contribute to the world. I really believe in cleaner energy. I really believe in the solutions that Shell is providing; lower CO2 footprint, bringing green solutions, and every one of us in Shell has the ability to impact that and really impact the world. Side-angled view of two men sat at a desk, computer screens in front of them. Behind those, a very large screen mounted on the wall displaying a world map. Wide-angled view of the same shot showing a third man to the left. Close-up of a man speaking. Side-angled view of Karrie Truath sat at a desk smiling and speaking, a man beside her. Back to close-up of Karrie Truath speaking to off-screen interviewer. Close-up of a screenshot depicting a colourful graphic. Wide-angled shot panning left to right of the trade floor. The best piece of advice I’ve ever gotten in my career is never shy away from a challenge. If an opportunity looks too big, too daunting, something you’ve never done before, that’s the one you need to take. It’s right for you. Don’t turn down the challenge. Take it on. Close-up of Karrie Truath speaking and smiling. Back to close-up of Karrie Truath speaking to off-screen interviewer. John Lo walks through office facing camera. Close up shot of John talking. I look after three parts of the Trading & Supply operations business. Terminal operations, pipeline company operations as well as logistics coordination in Asia. John Lo seen seen walking towards camera through bright, white office. Shot of man handing over some papers. Side shot of two men sitting at desk. The business is very exciting because we have new challenges and new opportunities almost every day and we have to react very quickly to capture those opportunities. We’re talking in hours rather than days in trading and supply. And being able to capture those values immediately is very rewarding for both myself and my operators. Leaders in my team must have the following: high level of integrity, being able to handle stress during difficult situations as well as having the commercial mindset which will help us to monetarise different optionalities [?] into that. Close up shot of John. John sitting at desk working on computer. Side, close up shot of John. Close up of hand on mouse. A flowchart showing on screen. Camera pans slowly to show a side shot of John. For somebody to aspire to be in my role, he or she needs to be able to identify your aspirations early in your career, work on those gaps as well as having the broadening assignments early on in your career will help you to achieve your aspirations. I enjoy my job because I’m excited every day coming to work, there’s always challenges ahead which we need to handle as well as there’s exciting new opportunities that is being discovered every day. And having the ability to monetarise those opportunities really excites me and feel very rewarding, not only to me, but also to my team. John Lo talking, facing camera. Portfolio Development Manager Holly Mowbray describes her job and what it takes to be successful in Trading & Supply. Shots of Holly crossing the street holding a coffee and approaching main entrance to her office building. I just recently started at Shell within the past year and a half. I was part of the BG acquisition. Holly speaking to camera in front of a view of high-rise office buildings. My current role is Portfolio Development Manager and what I’m looking for is ways that we can come up with new products and expand our portfolio by looking at cross-commodity options. Shots from behind of men sat in front of multi-screen setups displaying trading data. Close-ups of a woman and a man talking in a meeting room. Holly speaking to camera in front of a view of high-rise office buildings. We sell power; we sell gas; we have LNG terminals and we’re looking to make sure that we’re working across teams to develop products and come up with ideas that extract the most value for Shell instead of acting as individual companies. Holly approaching and entering a meeting room, holding some documents. Shots of her sitting at the table discussing the documents with a lady. To me, there’s many types of roles in trading. You can choose to be, like, a master of a specific market or a specific trading type or, I personally have chosen, I want to be a jack of many and a master of none. Holly working at her desk. Close-up of mouse moving over trading index on the screen. Panning shot of a six-screen set up displaying trading indices, etc. Panning shot of Holly working at the screens. So I want to understand trading at its most simplest level; like, if I trade gas and oil, I can trade widgets and corn, you know. It’s just a mentality; it’s about knowing what you’re selling, what products you’re providing, and being able to present it to the market. The opportunities in Trading & Supply are endless. We have access to so many different commodities worldwide and so your opportunities to grow and learn and develop as a professional—the sky’s the limit. Following Holly along a corridor, approaching a lady standing by a Shell sign, smiling as they begin talking. Close up of a trading index scrolling down on screen. I think, one of the most important things for being successful in the Trading & Supply organisation is building a network because the skill sets that are required across this chain are so vast and no one can know everything. Holly consulting with colleagues at her desk: a lady sits next to her explaining something. A man stands by her desk as Holly explains something to him; desk-level shot of another lady sitting next to Holly and explaining something; Holly and a man standing by her desk, chatting and laughing. And so it’s important that you recognise your strengths and your weaknesses and you need to go and find people who help make you better. And Trading & Supply is a perfect organisation where you can build that network, build your understanding and build better relationships that are going to help you be a better professional. Panning shots of people sitting in front of multiple screens in a large office and three men through the glass of a meeting room. Shots of graphs and data on screens and a woman talking to a man in front of a six-screen setup. Holly working in front of her screens, talking on a hands-free headset. When I was younger, I had perceptions about trading, that it was a man’s world and it was all about the dollars and you worked really hard and it was The Wolf of Wall Street. It’s not that at all; definitely, there’s a place for women and men and it’s a lot more collaborative and you’re working for the better good of a larger company. I enjoy my job because every day I feel challenged. I feel like it’s constantly evolving and changing. The world changes so quickly; the markets change so quickly and so if you’re someone who needs to constantly be challenged and thirst for knowledge, like, you want to be in Trading & Supply. Holly working in front of her screens, talking on a hands-free headset. Holly speaking to camera in front of a view of high-rise office buildings. I would definitely tell people, you should give it a try. Ask 20 questions, be curious, be humble, be open and if you have the right skill sets and the drive, you will thrive in this space. A conversation with Shell regional team leader, Dong Yuan. I have an engineering background and I worked in a competitive company briefly for three years as an engineer before joining Shell ten years ago. I have 12 traders and analysts working with me in my team. Wide-angled view of Dong Yuan walking through a wide corridor approaching the camera. Close-up shot of Dong Yuan as he walks past. Close-up of Dong Yuan speaking to off-screen interviewer set against an ochre-colored wall. Shot panning left to right of Dong Yuan and his team sat in a U-shape on the trade floor. Close-up of a man speaking. Close-up, upward-looking view of Dong Yuan sitting down looking at a paper on his lap, nodding. Back to close-up of Dong Yuan speaking to off-screen interviewer. I don’t see this role of leadership any different from any other leadership role in Shell and my understanding of the leader is we have to be truthful to the people who work with us and who work for us, and we have to take care of them and inspire them, create enough space for them to do their job properly. I enjoy the most about my job, it’s the flexibility of my job and the flexibility is something I define by the job scope I have. Shot of Dong Yuan standing up in front of a desk with three computer screens on. Close-up of Dong Yuan getting settled at his desk. Close-up of Dong Yuan’s hands typing on a keyboard. Close-up of Dong Yuan looking at the out-of-focus screens in front of him. Back to close-up of Dong Yuan speaking to off-screen interviewer. So in trading you have one main job scope which is to make the company more profitable and the rest of the detailed stuff, a lot of them are in your own hands, you define your own job scope. It is very liberating. Close-up, out-of-focus shot of Dong Yuan. In front of him, coming into focus, one the desktop screens displaying a Shell website. The screen goes out of focus, whilst Dong Yuan comes into focus. Wider angle of the same shot of Dong Yuan at his terminal looking at the screens in front of him. Back to close-up of Dong Yuan speaking to off-screen interviewer. Advices for someone to inspire to be in my role? I would give them two advice. One piece is to stay positive. It is easier said than done, but as a trader you tend to get stressed and to stay positive when you’re having a bad time or you’re having a bad position is really, really crucial in finding the best solution in the worst condition. Close-up of Dong Yuan talking. To his right, an out-of-focus female team member. Shot of Dong Yuan and two of his team members sat down looking out in front of them. Shot of three male team members sat down, the one in the middle speaking. Back to shot of Dong Yuan and his two team members as Dong Yuan starts laughing. Shot of a female colleague speaking and smiling, the man beside her out-of-focus. Back to close-up of Dong Yuan speaking to off-screen interviewer. And the second piece of advice I would give is that you need to balance your work and life. Don’t burn yourself out in trading, and trading is not about work hard for three months and rest for the nine. It’s about work hard and work consistent over a year, over two years, over a long period, so stay balanced is crucial to have a successful career in trading. Wide-angled view panning right to left of Dong Yuan’s team sat in a U-shape on the trade floor. Close-up of Dong Yuan talking to a male colleague sat beside him. Wide-angled view of Dong Yuan briefly putting his arm around the male colleague sat next to him and then laughing. Back to close-up of Dong Yuan speaking to off-screen interviewer. If you are really interested in trading and about the trading business, do apply and in the selection process, if you are selected… in the selection process we are going to guide you through and see whether you are suitable for the job, and if you are selected and we will work together with you and in coaching you to, in training you to make sure that you can achieve your highest potential in trading. Upward-looking view of Dong Yuan looking at a paper on his lap, his team members sat around him. Close-up of Dong Yuan’s hand holding a pen, a piece of paper on his lap. Side-view of Dong Yuan and his two of his team members talking. Close-up of two male team members. Close-up of Dong Yuan looking out in front of him. Close-up of three team members talking. Back to close-up of Dong Yuan speaking to off-screen interviewer. I was a mechanical engineer by degree. I went to work as an engineer at the Shell Deer Park Refinery and then went on to an operations role in the natural gas liquids trading group, became a trader in that group, and then moved onto the crude trading group from there. Reverse-angled view following Christine Sullivan walking through the trade floor. Shot of Christine walking through the shop floor approaching the camera. Side shot of Christine at her desk, three screens in front of her. Close-up shot of Christine at her desk. Having an experience out in the various sites, whether it’s a refinery, a chemical plant, really helps you when you come into trading because you’ve seen first-hand how the sites make their decisions, what are their economics, what are their drivers, where they get their value from and you’re able to then use that to help you optimise things for them, but also make money for trading as well. Close-up of Christine speaking to off-screen interviewer by a large window. Through the window on both sides high-rise buildings can be seen. Out-of-focus shot of people at work on the trade floor. In the middle of the shot, a side-facing view of Christine at her desk comes into focus. Close-up screenshot computer with a graphic and text reading Crude Oil WT. Close-up of the red and green bar graphic. Close-up of a screenshot showing a series of blue bars with numbers on them. Back to close-up of Christine speaking to off-screen interviewer. I think a lot of people can feel intimated coming into trading and feeling like they don’t know things about the trading business, so being willing to ask the questions, being willing to come out and say what you don’t know and ask somebody because there are resources literally everywhere, people with all kinds of different experience. And I find, because it still happens to me after all my years in the business, there are things that I’m learning still and people are very willing to share their knowledge. Moving shot across the trade floor showing people at their terminals, several screens in front of them. Wide-angled view of Christine and some male colleagues. She shakes hands with a man whose back is facing the camera. Christine nods and they begin talking. Close-up shot of Christine smiling. Shot of an open doorway to an office. To the left, a blue and white sign with text reading Huddle Room. Slowly coming into focus, Christine and a female colleague in the huddle room discussing something. Moving shot taken inside the huddle room of Christine talking and gesticulating. Wide-angled view of Christine and a female colleague on the trade floor talking, lots of screens to the side. Back to close-up of Christine speaking to off-screen interviewer. One myth that I’ve heard about the trading business is that it’s hard for a female to come and succeed in this group. Work life balance is cited often. I’ve had three children during my time here and I have a very busy family life and, you know, it’s worked out fine for me. Reverse-angle view of Christine and a female colleague on the trade floor. Zoom out slightly. Out-of-focus shot of people on the trade floor, lots of screens around them. Coming into focus is Christine talking to a colleague. Back to close-up of Christine speaking to off-screen interviewer. Trading is a very über competitive environment, but people are willing to help. I mean, it behoves everyone for people to be successful. It’s very much a team effort. So even though people are obviously assessed as an individual, team work is a big part even of how an individual is assessed because if the team doesn’t work, the whole group doesn’t work. Sped up, overhead view of the trade floor, people at work. Out-of-focus side view of people at their terminals. Coming into focus, a shot of Christine at her terminal. Side-view of Christine pointing at a screen and talking. A female colleague walks over to her. Close-up of Christine speaking to the female colleague. Close-up of a man pointing at one of the screens in front of him. Beside him, a female colleague. Close-up of a man speaking. Close-up of two men engaged in conversation. Back to close-up of Christine speaking to off-screen interviewer. Side view of Christine listening to a female colleague standing beside her. Christine smiles as the colleague turns and walks away. Back to close-up of Christine speaking to off-screen interviewer. What I like about trading is every day I can see the impact I’ve made to the bottom line. You see that moving up, hopefully, on a daily basis and it just makes you want to do more. 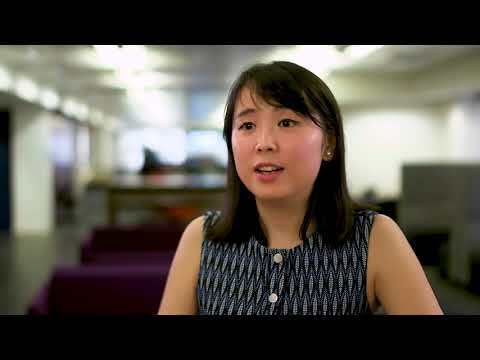 Lifei Liao talks about her job since joining the Trader Graduate Program at Shell. I joined Shell about six years ago as a Trader Graduate Program participant because I heard as a company that takes care of its employees very well in terms of development. Then I got interested in trading and supply because it’s a combination of the financial world and the industrial world. The program lasts about two and a half to three years and through the program I got enough re-training and resources provided by the company to become a trader. Close up of Lifei talking to camera. Lifei at desk looking at monitor. A mas beside her points at screen showing graphs in different colours. Lifei and man talking to each other. The screen shows columns of figures in different colours. Close up of Lifei talking to camera. The camera pans left to show several monitors. What I enjoy most about my work is the unpredictability of the future. Markets are moving all the time, it’s very volatile, I never know what’s going to happen next. Our job then is to link the information we have and form a view about what’s going to happen next. So this is a constant unknown situation, vast information for us to process, constant improvement and you will get to know about whether we are right or wrong immediately when you think the market is going to go up, you go long, and you will see whether we make a profit or not. So, it’s amazing, it’s fascinating. Close up of Lifei talking to camera. Shot shows her hand on mouse. Lifei working at desk looking at monitor showing maps and colums of figures. Lifei points at something on monitor. Lifei talking to man at desk. Close up of Lifei talking to camera. A group of people sitting and standing around desk and talking. A large room with many people working at desks looking at monitors. It’s true that over the history of oil trading there are a lot of men but over the past few years there are more and more female traders in the market as well. We’re equally capable, equally willing to learn and improve, equally strong to defend their positions and to negotiate and to conclude businesses. Applying is already 50% of the success, don’t be intimidated by a requirement itself, keep trying yourself and you will realise this is an organisation that embraces challenges and deliver. And what’s more important it’s really fun working here. Various shots of female workers sitting at desk looking at monitors. Close up of hand on mouse. Shots of monitors showing various graphs and charts and maps. Close up of female working at desk. Close up of Lifei talking to camera. Shot of various monitors side by side on desk. Lifei sitting at desk talking to man. Monitor with flickering figure in various colour. Lifei laughing. 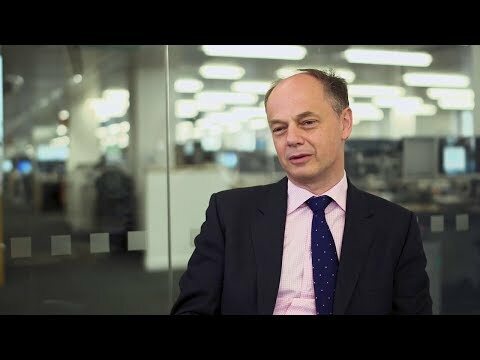 A conversation with Shell VP of trading and supply products, Mark Quartermain. Well, I’ve been in trading for two-thirds of my entire career so I’ve had plenty of opportunity to experience both the highs and the lows, but the one continuous high is it’s real-time and there’s a real-time feedback between effort, performance and outcomes. You see those things right through and people get a real buzz out of that. I get a real buzz out of that. I also get a real buzz out of seeing people develop themselves. That’s a huge, huge upside for me in terms of this role. It’s very much a people business. 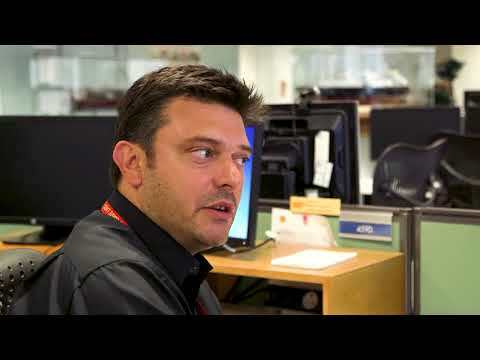 Close-up of Mark Quartermain speaking to off-screen interviewer set against an out-of-focus background of the trade floor. Close-up of a computer screen with several windows open. Close-up of a computer screen showing a colorful graphic. Close-up panning right to left of a lady looking at several computer screens in front of her. Close-up of a computer screen with four windows open. Shot of several men at their desks, one man in the middle is speaking. Shot of a man and a lady at their desks talking, several computer screens in front of them. Shot of a man talking and gesticulating to the lady sat next to him. We put a huge emphasis on diversity, not just from a gender perspective, not just from the point of the colour of your skin, we’re also very interested in different skillsets and that’s particularly important as this market becomes more and more competitive. I think the sort of skills we’re looking for are people who are hungry, people who really want to make the very best of themselves, people who like being in the middle of things, like being in an environment which is real-time, which all, with all the excitement and the challenges that that brings, and people that can bring something from the rest of the RDS organisation. But particularly if you’re an external applicant coming into the T&S world, that’s really critical. Don’t underestimate how valuable that is to us. We have a number of recent examples of individuals who’ve come in and made a huge difference in changing our mind-sets because they came from a slightly different part of the business. Out-of-focus shot of people on the trade floor panning down showing small flags stuck to the top of desktop computers coming into focus. Wide-angled view panning across the trade floor showing computer screens, some with different country flags on them, and people’s heads peeking out above them. Close-up of a man at his desk talking while wearing a headset. Wide-angled view of people at work on the trade floor. Shot of a digital clock showing the different local times in Lagos, Moscow, Tokyo, Singapore and Bangkok. Back to close-up of Mark Quartermain speaking. Shot of a man wearing a headset speaking surrounded by computer screens. Close-up of a man looking out in front of him. Close-up of a computer screen with two windows open, each showing a sort of graph. Close-up shot of three small flags. Slowly coming into focus beyond the flags, two ladies wearing headsets at work, each with three screens in front of them. Back to close-up of Mark Quartermain speaking. The myth to debunk is it’s all about people yelling and screaming and shouting. We’re in a trading room right now – can anyone… is anyone shouting? This is actually a pretty accommodative environment I would say. It is a place where we expect high performance from individuals, but it’s actually a [unclear] place which I think is quite accessible and quite accommodating to people of every different persuasion, of every different background and temperament. Wide-angled view panning left to right of the many computer screens on the trade floor. Side-angled view of three people at work at their desks, each with six screens in front of them. Shot of a man nodding as seen peering through several out-of-focus screens. Shot panning right to left of several men at their desks, the man in the middle looking up and speaking. Shot of a man typing on his keyboard. Shot of three people sitting close together and discussing amongst themselves. Close-up of a man talking on the phone. Close-up of a lady looking at her computer screen in front of her. Back to close-up of Mark Quartermain speaking to off-screen interviewer. I think for any aspiring leader, I think the first question you have to ask yourself is do you really care about people? You’re not just doing this because you want to supervise seven people; you’re doing this because you care about people’s development. And it’s not just about the mid-year review and the end-year review; it is an all-year-round responsibility that you are taking so that people care is a huge element and then of course can you set the strategy for an organisation? Can you have a vision? Can you think outside the tactical? I think those are the two critical qualities I’m looking for. Close-up of the side of a man’s face as he talks while gesticulating at the computer screen in front of him. Zoomed out shot of the same man gesticulating and speaking to two colleagues sat either side of him. Wide-angled view of a man approaching a long desk where several people are working. He stops as one of the men sat down starts speaking to him. Close-up of shot panning upwards of a man supervising. Shot of a group of men talking, one of them looking upwards. Back to close-up of Mark Quartermain speaking to off-screen interviewer. I think the barriers to entry into trading and supply are lower than they’ve ever been, not from a quality perspective but very much from the point of view of our acceptability of other people’s different skillsets. So as we broadened so other skillsets are much, become much more useful to us and we found great successes in people recently. So we’re asking people to be themselves, we’re asking people to, you know, to celebrate their experiences and come in and make a difference to our culture, to our understanding of how to work with the rest of RDS. But, quite frankly, it’s about being yourself and bringing new experience. Shot of several computer screens with post-it notes stuck to them, slowly panning down bringing into focus a lady’s face as she looks upon one of the many screens. Shot panning right to left of various computer screens next to each other, each one displaying something different. Close-up of the side of a lady’s face as she speaks, another lady sat beside her. Sitting beside this lady, seen out-of-focus, a man. The two ladies turn their heads and look at the man, now coming into focus as he speaks. Back to close-up of Mark Quartermain speaking to off-screen interviewer. President of Shell North America LNG Tahir Faruqui describes what he looks for in a candidate and why he enjoys his job. Instrumental music featuring plucked electric guitars. So I’m responsible for all the marketing and trading activity out of the North American region. What I’m looking to do is not only represent Shell’s interest from the production side and taking it to market but also looking at third parties that are looking to liquefy natural gas and buy competitively priced liquefied natural gas and take it to market. Shots of Tahir standing in a meeting room talking to some men around a table and pointing to a screen; they smile and Tahir high-fives one of them. Tahir speaking to camera in front of high-rise view. When I’m looking for leaders, I’m looking for people who are authentic, credible but inspirational. For me, it’s not just about getting another person on the team that has been successful in the past and now it’s time for them to be rewarded and moved up; I’m looking for somebody who’s always, constantly innovating, adapting and leading not only themselves to the change but also bringing the entire organisation along with them. Shots of Tahir sitting next to a woman at her desk as she talks and shows him documents. Tahir speaking to camera in front of high-rise view. What I enjoy most about my job is the ups and downs that we go through; it is a rollercoaster every single day. More shots of Tahir standing in the meeting room, considering then explaining something on the screen. Panning shots of three men listening and one asks a question. Tahir speaking to camera in front of high-rise view. And you just don’t know. You can look at your schedule, you can plan your day but every time you show up, there’s something interesting happening and you always have to adapt; and that keeps it interesting, that keeps it motivating and that keeps it dynamic.